Christmas 1883 was a charitable one, from the nation’s capital to Dakota Territory. President Chester Arthur’s 12-year-old daughter Nellie formed a Christmas Club with 75 children who donated money to put up a huge Christmas tree. It was decorated with expensive ornaments that would be unveiled at a charity ball for underprivileged children in Washington, D.C.
And in Dakota Territory, a committee at the Methodist Church in Hot Springs organized a Christmas program to raise funds for the needy in that town. In Washington, D.C., the Christmas Club provided entertainment for more than 2,000 ill and homeless children. Nellie Arthur distributed gifts, including the tree ornaments. The Methodist Church committee in Hot Springs raised $40 for the less fortunate through its Christmas program. That’s equivalent to about $1,000 now! “Many hearts and homes were thus made glad through the generous sacrifice of the children,” read an article in the Hot Springs Weekly Star. The Soldiers’ Home in the community had two Christmas trees decorated in the national colors and bearing a sack of goodies for each veteran. Christmas evening was spent with music and games. 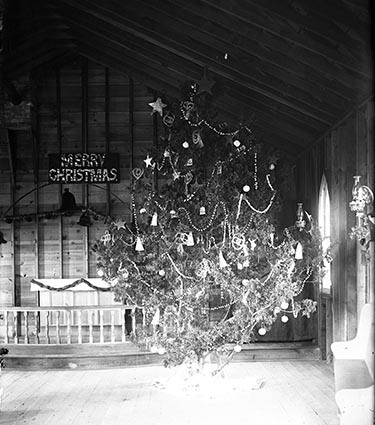 Activities such as putting up Christmas trees and buying gifts occurred throughout Dakota Territory. Merchants advertised choice cigars from the Madison Cigar Factory, china dishes, glassware, lamps, silk handkerchiefs, jewelry, stoves, shopping bags, overcoats and more. “The little girl who finds a Webber Doll ‘in her stocking’ at Christmas time will be the envy of all,” read an ad in the Kimball Graphic for a singing doll. Customers at the music store of J.P. Wagoner in Yankton were given a ticket for a chance to win a $65 music box with a purchase of $5. In what could be seen as an early precursor to the modern “Small Business Saturday,” an advertisement by Emiel Brauch in the Turner County Herald in Hurley advocated shopping at home. “As usual I am coming to the front with as fine a lot of Holiday goods as ever have been brought to Turner County. Do not labor under the impression that you can do better by sending your money to some eastern town,” the ad read. Brisk holiday sales were reported by newspapers in Dakota Territory. In Wilmot, shoppers spent about $1,000 the day before Christmas. “Monday (Dec. 24) was a beautiful day and the streets were crowded with teams. Our merchants did a rushing business,” stated the Kimball Graphic. Christmas Eve and Christmas Day brought church services and visits by Santa Claus. All of Kimball packed the Presbyterian Church on Christmas Eve, according to the Kimball Graphic. “The Christmas tree excited universal expressions of admiration which it well merited, for a more beautiful one we never remember of seeing. It reached nearly to the ceiling and the graceful limbs were strained to the utmost to sustain the many elegant presents grouped artistically upon the branches.” Santa Claus entered the church at the end of a program and spent an hour distributing 367 presents. “It was with happy faces the great crowd dispersed feeling that Christmas eve had been the event of the year,” stated the Kimball Graphic. The proprietor of the Bradley House in Mitchell served a Christmas dinner of 61 different dishes to 162 people. At the Clifton House in Clifton, Sully County, oysters were served for Christmas dinner. People in Canton spent Christmas Day skating on the Big Sioux River. Nellie Arthur received a pair of diamond earrings from her father as a Christmas present in 1883. Although her father’s term of office ended in 1885, Nellie returned to Washington, D.C. for many years to preside over the Christmas Club. And, of course, the traditions of visits from Santa Claus, shopping, putting up Christmas trees and giving to the less fortunate also continued in Dakota Territory.